Providing you the best range of acrylic three in one portion thali, acrylic dosa portion thali, acrylic five portion tray with chapati plate and acrylic two in one portion thali with effective & timely delivery. We are one of the leading manufacturers and suppliers of Acrylic Three in One Portion Thali. 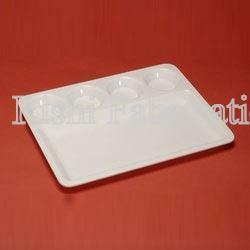 The offered Acrylic Three in One Portion Thali is specially designed to serve meals. Our supplied Acrylic Three in One Portion Thali is designed to hold, multiple food items, in separate portions of the thali. 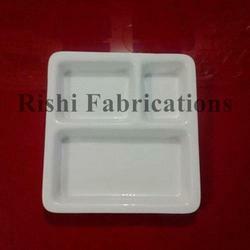 The offered Acrylic Three in One Portion Thali is very affordable and cost effective in rates. We are regarded as the well-known enterprise, sincerely occupied in supplying a vast range of Acrylic Dosa Portion Thali. These Acrylic Dosa Portion Thali are vastly cherished in the market for its top quality, precise size and durability. Our collection is hugely used in national and international markets. Due to high demand, these offered products can be customized as per the various requirements of our valued customers. Widely appreciated and acclaimed for their quality, our firm is engaged in offering a wide array of Acrylic five Portion Tray with Chapati Plate. Professionals at vendors' end manufacture these products by making use of high grade raw material and cutting edge techniques in order to maintain their compliance with international standards. Our offered Acrylic five Portion Tray with Chapati Plate are designed and tested under the strict supervision of our experienced professionals possess expertise in their respective domain. Acrylic five Portion Tray with Chapati Plate products are praised for their quality and attractive designs. We are one of the well-known manufacturers and suppliers of Acrylic Two in One Portion Thali. 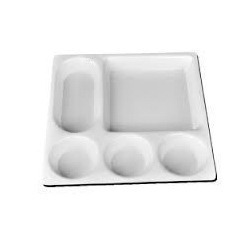 The offered Acrylic Two in One Portion Thali is designed for serving two food items in one thali. 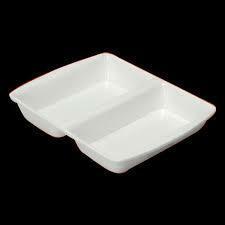 Our supplied Acrylic Two in One Portion Thali is easy to wash and clean. The offered Acrylic Two in One Portion Thali is very affordable and cost effective.